A rendering by the Design Collaborative offers a vision for Headwaters Junction, a potential cornerstone of riverfront development. Plenty of good ideas have surfaced as residents have brainstormed over Legacy Fund spending or offered suggestions for Regional Cities projects. But many of the ideas borrow from other communities – a water park or a San Antonio-style river walk, for example. But something unique – something intriguing – was missing. Until now. The Fort Wayne Railroad Historical Society’s proposal for a new riverfront destination, Headwaters Junction, might be just the project to ramp up strong revitalization efforts already in the works and also become the kind of attraction visitors will point to with envy when they return to their own communities. 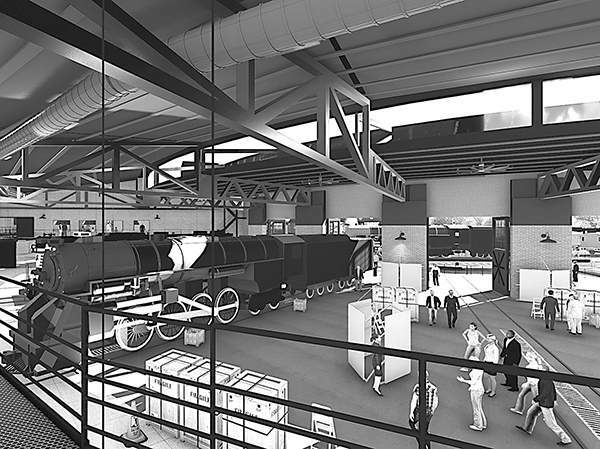 The railroad enthusiasts released concept drawings by Design Collaborative last week. They show a vintage-style roundhouse between Harrison and Wells streets, just north of the proposed riverfront park on the north side of the St. Marys River. A rail yard park and train turntable would service an excursion railroad line to the Fort Wayne Children’s Zoo. The roundhouse also would feature a 1940s-inspired restaurant and observation deck overlooking the rail yard and downtown Fort Wayne. The historical society has programming ideas: regular excursions (Think "Thomas the Tank Engine"), holiday events (Think "Polar Express"), railroad camp, interactive displays, revolving exhibits and more. "Right now we’ll have 4,500 people in 16 hours during our events in December, to say nothing of the thousands more that the 765 (steam locomotive) draws when it operates," said Kelly Lynch, director of marketing and development for the Railroad Historical Society. "We could multiply our attendance numbers by being able to host regular events, train rides and programs right along the heart of downtown." A preliminary study suggests Headwaters Junction could draw more than 120,000 visitors each year. Imagine the potential of marketing the city for conferences and regional travel if Visit Fort Wayne had a one-of-a-kind attraction to promote, particularly one linking downtown to the zoo – Fort Wayne’s primary visitor draw. Bold ideas often come with big price tags, of course. The project cost is estimated at as much as $18 million – a daunting fundraising task for a nonprofit organization and one that must be considered in the context of other efforts already under way. But Headwaters Junction can make a strong case for support. The Railroad Historical Society’s excursions on historic steam locomotive 765 sell out quickly, and the very sight and sound of the locomotive draws crowds from afar. Trains have broad appeal. An advisory board of community leaders and a separate non-profit organization have been established toadvance the project. "Our board is excited at the possibilities that Headwaters Junction represents for future riverfront development. We are aggressively pursuing ways to make this a reality," said Fort Wayne developer Don Steininger. In Headwaters Junction, northeast Indiana might finally have an attraction as iconic as San Antonio’s River Walk and as family friendly as a water park. Best of all, it could have an attraction unique to the region and true to northeast Indiana’s rich history.